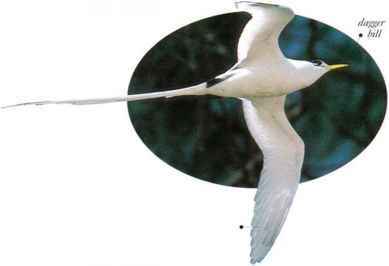 A dark-backed seabird with a white underside, the Manx Shearwater flies low over the sea, making rapid, tilting glides alternating with quick wingbeats. The shearwater feeds at the surface or in shallow plunge-dives, taking small fish, squid, crustaceans, and offal from fishing boats. Nesting colonies are located 011 hilly offshore islands Flocks are seen floating offshore, waiting to visit their nests after dark. They eventually go ashore, amid a chorus of crowing calls. • NEST A hollow, sometimes lined with grass, in a burrow or occasionally in a rock crevice or cavity. 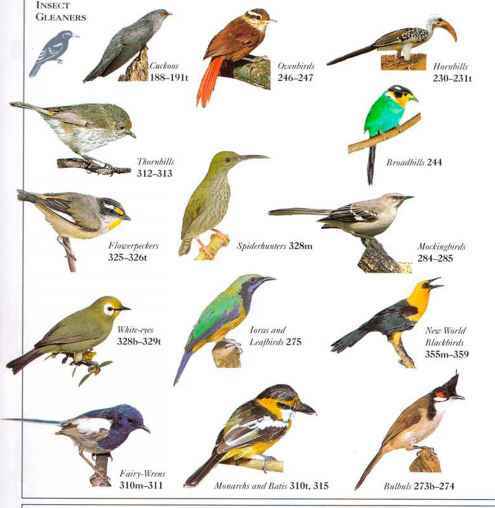 • DISTRIBUTION Breeds along coasts of n. Atlantic Ocean. Winters ¡11 mid-ocean, as far south as S. Atlantic Ocean. I his beautiful seabird Hies gracefully with its streamlined body, slender tail, and long wings It feeds by plunge-diving into the sea for fish, squid, and crustaceans. Both sexes have long, white tail streamers, which they show off in acrobatic display flights over the nesting area. Kggs are laid in a crevice, on bare ground, or underneath overhanging rocks.